This is a 1936 model cathedral in beautiful original cabinet with only the most minor of wear and miniscule marks that add to the nice patina. 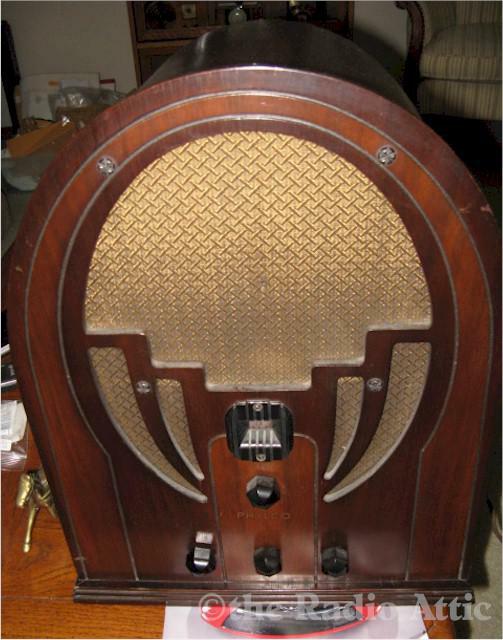 Radio was gone through (serviced) years ago with new tubes, and electronics as necessary; has new period correct AC cord. Plays very well with antenna from about 1000 to 550 KC, other end quiet; sure it's something simple causing this. Antenna length etc. All in all, an excellent original example. Shipping extra $35.00 with very careful packing and insurance. Radio is smaller than its big brothers at 16"H x 12"W x 8"D.
You are visitor number 4,618 to this page.